Hi, Heffy Doodle friends! It’s Cassie, and I’m back this week to share another cute HD card with you! We have a lot of fall birthdays in our family, so it’s time for me to stock up on those b-day cards like crazy! Today I’m starting to stock up with this cute card. 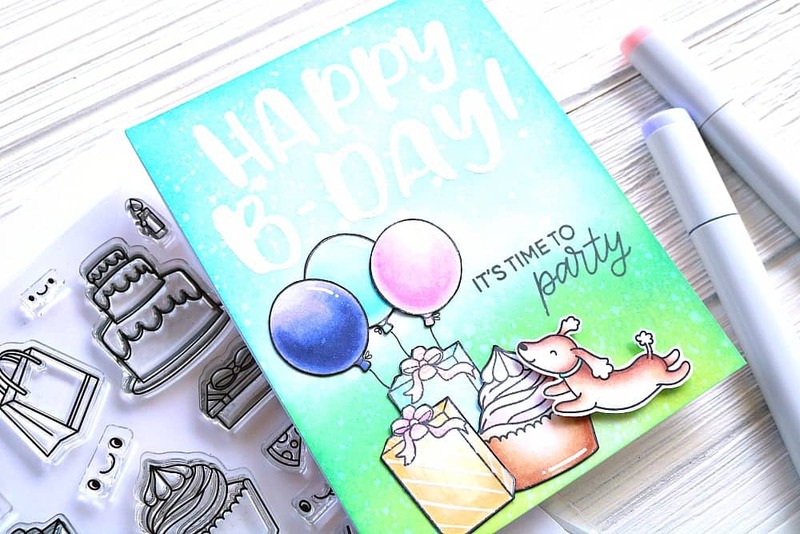 I started the card today by stamping the ‘happy b-day’ from Big Bold Words set with VersaMark ink and heat embossing it with white embossing powder at the top of a A2 size card panel. Then I took out my Broken China, Twisted Citron and Lucky Clover Distress Oxide inks and started ink blending! The thing I love about these colors is you can just blend them from each end of the card panel and they look like grass and the sky. 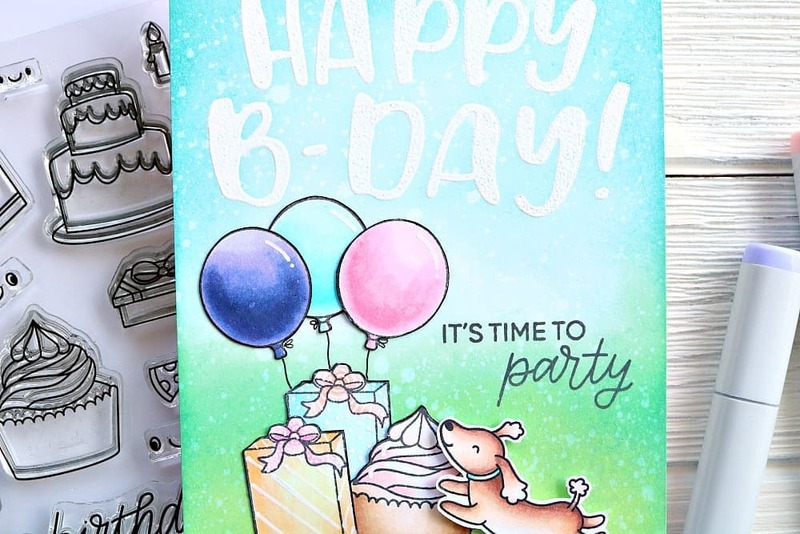 Next I stamped out a bunch of the cute images from the Party Palooza stamp set, as well as a pup from Yappy Happy Mail. I used my Copic markers to color them in and fussy cut them out with my precision scissors. I love how the Party Palooza images make it look like a little party. To add a little extra interest to the images I drew details with my white gel pen on them. I adhered all of the images down with some tape runner and the dog with foam tape to look like he was jumping. 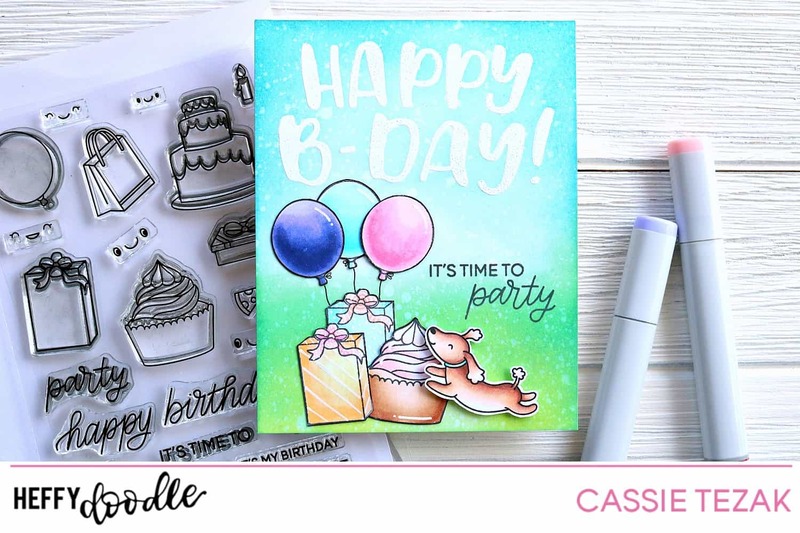 I added strings to the balloons and decided to stamp another sentiment for this little puppy party. And with that my card was complete! I hope you enjoyed the card I made for today. Who else out there would love to go to a puppy party with this little guy?! Thank you so much for stopping by and I’ll see you again soon with another card!